Have you always wanted to breathe underwater? but never had the time or been in the right place at the right time? Well, look no further! Here at Scuba Playa we can offer you a one day experience of a life time starting of a 8.00am in the Dive Center with a welcome and informative briefing from your Instructor on the basics of Scuba and an introduction to the equipment and skills you will be using and practicing with. Following that we head to our training pool where you will have time to practice breathing and getting used to the sensation of being weightless in the water! Your Instructor will run through some easy but very useful skills with you and make sure you are ready for your open water dive! After a short lunch break we head out by boat to our beautiful local reefs to an average depth of 7m/22ft but no more than 12m/4oft. You will head off with your Instructor with no more than 3 other divers for a truely unforgettable adventure! After a short surface break on deck you have the option of getting kitted up again and doing another dive on a different reef!! Dive time is approximately 40 minutes for each dive. 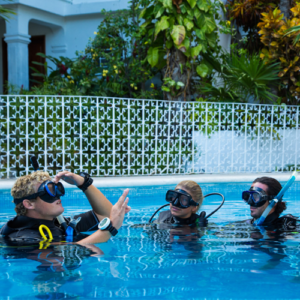 We also offer the PADI Open Water Course upgrade if you have a little more time and want to keep going with your training and get certified before heading home! 2 additional training dives are required. Scuba Playa is not just renowned for the variety of courses we offer. 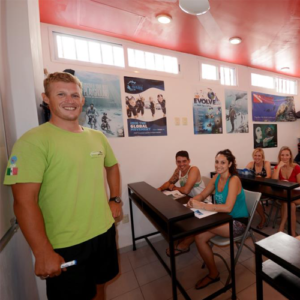 We are about offering high quality training, personal care, small groups, variety of languages and full compliance with the PADI standards. Because of our flexible schedules and personalized service, we will find the best way to accommodate your very busy vacation schedule!